Dr Adam Kirrander's group and collaborators in Copenhagen have recently had a paper accepted to Physical Review Letters. 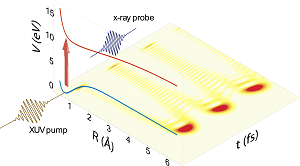 The article in Physical Review Letters entitled "Electronic coherence in ultrafast x-ray scattering from molecular wavepackets" proposes a new type of experiment that uses so-called X-ray Free-Electron Lasers (XFELs) to follow the motion of nuclei and electrons during a chemical reaction, and shows how a subtle quantum mechanical effect known as coherence influences the experimental signal. The phenomenon of coherence is believed to influence a wide range of processes, for instance energy transport in photosynthesis, but is difficult to measure experimentally. The type of experiments proposed by the authors could come to play an important role in elucidating the role of coherence in complex photochemical reactions.